If there’s one project that could break down mainstream resistance to sustainable building it’s the 59 unit third phase of Durkan Residential’s Silken Park housing scheme in Citywest – Ireland’s largest certified passive house development to date. It’s not hyperbole to say that this scheme may with hindsight be regarded as a key turning point in the normalisation of next generation sustainable building in Ireland. A development of rapidly built, affordable, all electric passive houses set up to adapt easily to net zero energy, the scheme is also the first by a private developer to meet the Irish Green Building Council’s promising new Home Performance Index sustainability certification scheme. What makes all of this all the more remarkable – and subversive – is that the homes are being built of masonry, utilising local materials and local skills, but with a smart, methodical, lean approach to design and construction. With homes being turned around to world class comfort, health and energy performance standards in a twelve week build schedule, Silken Park takes a disarmingly simple approach: single leaf hollow block construction sat on an insulated foundation system, the walls wrapped in a generous layer of high density Rockwool external insulation, with a sand and cement render internally acting as the airtight layer. For passive house certifier Tomás O’Leary of Mosart, the fact that a well detailed wall integrating hollow blocks – which had unfairly been tarnished due to their role in an inadvisable yet widespread build-up with internal insulation – is an important breakthrough. “It basically proves that it’s not the materials you use – it’s how you use them,” he says. “It’s not what you have between your hands that counts – it’s what’s between your ears. You can keep using the system that you know and love, but just do it way better. Passive house is hard enough without changing the whole way you build a building.” But phase three of Silken Park is no full stop. It’s rather the latest point in a journey Durkan Residential have been on since brothers Patrick and Barry Durkan set up the company in 2003. The 55 unit first phase was built in 2007 to a high standard in terms of finishes, but built to the energy performance standards under building regulations at the time. When the new build market nosedived, the brothers teamed up with architect and sustainability consultant Jay Stuart to form Ecofix in order to to capitalise on the new market for retrofit, and external insulation in particular. Stuart, the company’s technical director, says Ecofix specialises in “cost-effectively building low energy, high quality external envelopes.” According to Stuart, the company has accumulated invaluable experience and knowledge in its efforts to improve the existing stock – knowledge that can be applied to new build too. “It’s been a journey together working on retrofit for the last eight years – getting used to the idea of what’s effective, what’s cost-effective, and to trial ideas on relatively small contracts, and to be thinking about airtightness, thermal bridging and ensuring we get adequate ventilation. (Above) The houses are constructed of single leaf hollow block walls finished outside with Rockwool’s REDArt Silicone and BrickShield external insulation systems, including 200mm Rockwool semi-rigid insulation. As previously reported in issue 18 of Passive House Plus, the company began to apply its learnings to new build in last year’s 15 unit second phase at Silken Park, itself a laudable low energy project which featured essentially the same wall build-up, but with double rather than triple-glazed windows, a strip foundation system, demand controlled ventilation and condensing gas boilers. The project blitzed the airtightness target of under 2 ACH – nine of the homes came in at less than 0.534 ACH, and the worst recorded result was 0.812. The Durkans took note: passive house was within reach. He needn’t have worried. The final blower door test result on the show house of 0.20 – coincidentally in both air changes per hour and m3/hr/m2 at 50 Pascals – is one of the best results Passive House Plus has ever encountered, in particular for a masonry building. It’s three times lower than the passive house threshold, and no less than thirty-five times tighter than the backstop of 7 m3/hr/ m2 under Irish building regulation, making a mockery of the state’s targets. (L-r) A site visit with Patrick Durkan, Department of Housing advisor Seán Armstrong, Minister of State for Housing Damien English and Electric Ireland general manager Paul Stapleton. To stretch credulity further, the sealing work was done by crew members from fabric contractor Ecofix who were experienced in external insulation, but had never done airtightness work before. But they didn’t get there by fluke. The buildings were carefully detailed for buildability, toolbox training was delivered for site operatives by Barry Durkan, and renowned airtightness expert Roman Szypura of Clioma House – who had served as airtightness contactor on phase two – acted as airtight consultant. According to Ecofix CEO Kevin Durkan, the team’s formidable results were underpinned by decisions taken long before the project went on site. “It’s because it was so well designed,” he says. “It was very easy to follow, and doesn’t take much to police it. We were going around the envelope to look for a pin hole to show the guys what a tiny leak is like at 50 pascals of pressure, to feel the wind coming through. We couldn’t find one, other than the keyhole.” The end of terrace show house was no anomaly either: the two other smaller dwellings in the same block kept up the impressively high standards, clocking up results of 0.28 and 0.29, giving an average for the three houses of 0.24. (clockwise, from above) Barry Durkan’s own detail for an airtight attic hatch, a plywood box with a depth to match the 450mm attic insulation; exhaust and intake holes for the MVHR system, separated by a corner wall to avoid crossflow/contamination, sized large to allow a slow fan speed and quiet operation; airtight taping around Munster Joinery windows; sand and cement render to the blockwork internally for airtightness. (right) airtight grommets around entry points for cabling. According to Barry Durkan, the requirement to define the spec and build process early on in the Passive House Planning Package software is one of the key reasons the company is achieving a 12 week build schedule. “PHPP gives us a system approach to building. That’s what attracted us in the first place. He adds that the clarity of the process creates a good atmosphere on site. “Everyone knows where they’re going. We’ve got good quality control.” Barry Durkan also emphasises the decision to use construction software developer VRM Tech and their cloud based collaboration and invoice management platform Refurbify – which harnesses the ubiquity of smart phones to give site operatives evidence-of-use apps that track progress in real-time against planned works and specified products. “It’s been very positive,” he says. “Initially the operatives were sketchy about it because it required a bit more time, and evidence of each individual house. (Above, top to bottom) Installation of the Kore Passive Foundation system with EPS insulation beneath the slab and around the ring beam at the perimeter, eliminating thermal bridging through the ground floor, while minimising construction waste in the process – the off cuts shown here are from five houses. The evidence trail also played a key role in the project gaining Home Performance Index sustainability certification in spite of the decision to apply being taken when the project was well advanced. “We did an independent review of our figures of a comparable house – standard block construction and timber frame regs compliant houses, with comparable finishes in terms of kitchen and finishes. It’s coming in cost neutral.” According to Kinnear, this is in large part down to a decision to start with a blank piece of paper and design from first principles. “Certainly historically, developers have looked at new regulations coming in, brought a consultant in and said: ‘here’s my house, what do I have to add to it to make it comply?’ As opposed to value engineering it.” He has a point. The prevalence of this kind of approach is reflected in the costing exercise the Department of Housing does in its regulatory impact analyses when introducing proposed changes to building regulations, where a typical house design is chosen, and the extra cost of ratcheting it up to the new standard is quantified. That can also mean cutting down on environmental impact, by utilising fewer materials. The use of single leaf walls of hollow blocks – which use some 30 to 40% less concrete than a comparable solid block, and are relatively quick to build with – is one example. The KORE Passive Slab is another. Structural engineer Hilliard Tanner explains that the systems is essentially a continuous ring beam around the perimeter attached to the floor slab, with thickenings in the slab for load bearing party and internal walls. “In all projects, the insulated foundations are designed to take account of the ground conditions and the loads from the structure on them - which in our experience rarely happens for traditional strip footings.” says Tanner. Jay Stuart is a fan. “It’s a different conceptual approach to digging a trench and pouring lots of concrete to support the point loads or structural loads which are usually the external and party walls,” he says. “The thing about the Passive Slab is that it’s a floating foundation which instead of sitting on the ground is sitting on a layer of impervious insulation, sitting on stone. This simplifies the build process and saves money. “You don’t have to dig trenches, you don’t have to cart away sub soil,” he says. KORE claim that the system can reduce concrete use by up to 50% compared to a conventional strip foundation system, which means cost and environmental savings. Electric Ireland general manager Paul Stapleton explains why the state’s largest electricity utility sees a bright future for projects like Silken Park. Electric Ireland is proud to be associated with the Silken Park Development, which brings the benefits of a fully future-proofed all-electric home to homeowners today. Electric Ireland has a long record of providing customers with sustainable energy solutions and helping them to use less energy. Over the past three years, we have invested about €20million in this way, reducing customers’ bills by circa €50million or over 430GWh of energy, equivalent to the annual consumption of about 50,000 homes. Climate change is the defining challenge of our generation. ESB, which Electric Ireland is part of, aims to lead Ireland’s transition to a low carbon economy, using our knowledge, skills and experience in our business, and that of our partners, to find the best route for society as a whole. At Silken Park, we have worked with Durkan Residential to develop an “all electric home”. These homes have very efficient heat pumps to provide all the heating and hot water and they are pre-wired for electric vehicle charging. They are healthy & comfortable to live in, with low maintenance costs and very low energy costs – as much as 50% less than typical homes. They are emissions-free, so the air in the neighbourhood is clean and healthy to breathe. All of this comes for the same price as a normal house. Stuart points out a health and safety headache is removed by migrating from conventional foundations. “You dig a trench. As soon as you dig that you’ve got a safety hazard. You then pour concrete into it up to a certain height. Then you build rising block walls up to the slab height. And you don’t usually back fill the trench until the rising walls are built up. So, during those four processes, until they’re complete you have a trench – a safety hazard that you can trip up on. It’s messy and the edges are irregular. Passive House Plus visited the site in February for an industry launch event, wangling a lift in Stuart’s Nissan Leaf EV. Had the houses been finished, Stuart would have been able to recharge his car on site: all 59 houses will come pre-wired for EV charge points. In fact electrical innovation is a theme of the project: the homes use Nilan Compact P units for all heating, hot water, ventilation and – if required – a small amount of cooling, via a combined exhaust air heat pump and heat recovery ventilation system. The roofs are designed to take the weight of a solar PV system covering the whole roof area. What’s more the residents at Silken Park will have the chance to charge their EVs and run their heat pumps for free: utility provider Electric Ireland has recognised the significance of the project, and is offering the occupants of the 59 homes three years worth of free night rate electricity, provided they sign up to the company’s new Pay as You Go package within three months of moving in. For Patrick Durkan, there’s a clear route ahead to further refine specs, deliver more cost savings, and improve environmental performance. “I call it positive living,” he says. Patrick Durkan says Silken Park serves as proof that the common perception that being green means making sacrifices isn’t always true. “I don’t like the concept of green – tree hugging, putting on an extra jumper,” he says. “I spend a quarter of my fuel, I have a better, healthier, more comfortable living environment, and we don’t add to government fines for failing to meet our carbon reduction targets. The benefits of this are actually immeasurable.” Patrick Durkan adds that the industry and parties invested in solving the housing crisis – councils, housing associations and politicians – need to take note of what is achievable and possible today. The tens of thousands of families – this writer included – gripped in the turmoil of a housing crisis would be well served if Durkan’s words are heeded. There is considerable risk inherent in engaging in a rush to build quickly, when faced with a skills gap, and an industry is having to work out how to meet dramatically improved energy performance targets under national building regulations. Low energy buildings behave differently, and the industry’s broad failure to get to grips with building physics means that some considerable risks – overheating, poor indoor air quality and both surface and interstitial condensation, never mind failure to deliver anticipated energy savings – won’t be discovered until tens of thousands of buildings have been built, and the damage is done. Considered, proven approaches – and the 25 year old passive house standard stands out uniquely as a safe approach that is tried and tested, cost-effective, and delivers extraordinary comfort and energy performance – must be central to our plans. If the industry is willing to build upon the improvements in knowledge and workmanship evident in recent construction output, it has nothing to fear from going passive. Building type: Phase 3 of a private development, consisting of a mix of terrace, semi-detached and detached houses. Twenty-four Type B 2-bed terraced/ semi-detached houses (84m2), twenty-nine Type A 3-bed terraced/semi-detached houses (109m2), five Type C 4-bed semi-detached houses (120m2) and one Type D 4-bed detached (126m2). Passive house certification: All 59 houses to be certified. PHPP/DEAP figures below are for three-bedroom, semi-detached units. Windows: Munster Joinery passive certified windows. Overall U-value: 0.8 W/m2K Heating & ventilation system: Nilan Compact P unit, Passive House Institute certified, combining mechanical heat recovery ventilation with hot water generation and storage. MVHR heat recovery efficiency at 75%. 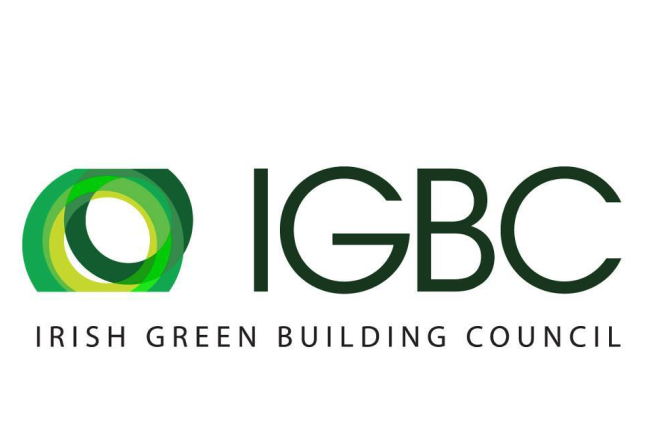 Not content with being Ireland’s largest certified passive house scheme, Silken Park is also the first scheme by a commercial house builder to achieve the Irish Green Building Council’s new Home Performance Index sustainability certification. IGBC director Pat Barry explains how it got there. The fact that the Silken Park homes are offered at starter prices goes to prove that quality and sustainability are not about adding cost, but simply about the choices, and the skills of the homebuilders. IGBC was delighted to award the first Home Performance Index certification for a private development to Durkan Residential. The Home Performance Index takes a more rounded look at sustainability, looking beyond just energy efficiency to assess other key quality and sustainability criteria that matter to the home buyer and the planet. With Silken Park, passive house certification meant some of the indicators within HPI were deemed to be met but sometimes for slightly different reasons, the designed ventilation system is required principally to guarantee good indoor air quality rather than energy efficiency. The homes also met other HPI requirements such as water efficiency and daylighting, together with achieving the required score based on assessment of access to amenities, public transport, acoustic performance and responsible use of land. We were impressed at Durkan’s attention to documenting the construction process which meant we could quickly turn around certification based on core criteria. Had we delved further into non-core criteria we are sure we could have awarded a higher level of certification. The scheme also showed great innovative thinking such as the wiring for the future PV and electric cars. Within the HPI airtightness is a key indicator of on-site quality control so the figures achieved on Silken Park, destroys the argument that Irish builders lack the ability to build as well as anyone in Europe. It proves that if we start measuring things, and setting quality benchmarks then the competitive innovative instinct rapidly sets in. The construction industry is dynamic so practices, skills, innovation, and building components are constantly evolving and with the right drivers, are well capable of moving quickly well beyond minimum compliance to true excellence. It is best to measure against what the better players in the market like Durkan Residential can deliver rather than relying on backstops against the worst. The Home Performance Index is aiming to do just that, gathering and sharing the data on best practice for a full range of indicators from airtightness to lesser known benchmarks on waste management, sustainable procurement, ecology, water, and embodied carbon. Silken Park gives us hope that the construction industry is capable of tracking, improving and competing to true excellence over the next five years. The carrot for the developer will be the recognition by home buyers and eventually a better price or faster sale. Why hide your light under a bushel if you have the documentation to prove that you build better than the rest? For this reason IGBC has now launched the Home Performance Index platform where home buyers can skip the agents’ guff and look directly for quality third party certified development like Silken Park. Pictured handing over the HPI cert are (l-r) IGBC chief executive Pat Barry, South Dublin County Council leas cathaoirleach Martina Genockey and Patrik Durkan. VRM Technology develops smart software solutions to decrease costs and increase energy efficiency in the built environment.